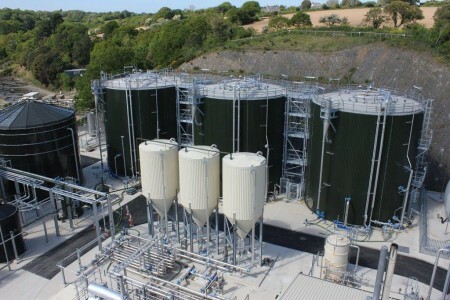 In the foreground, the three pasteurizers at Bellozanne STW on Jersey, which hold sludge at 55 degrees C for a minimum of 4 hours, prior to passing to the three anaerobic digesters (in the background). Jersey. The largest of the Channel Islands. Famed for its Royal new potatoes as well as its equally delicious dairy products from its iconic purebred cattle – and now, for those with an interest in exemplary engineering standards of management, research, design, efficiency, easy maintenance and high performance……………… its sewage treatment works. “Eventually we visited Landia in Denmark to see for ourselves” continued King, “As well as seeing the GasMix digester mixing system, the set-up and the people was impressive the moment we walked in – which gave us confidence too in the type of service and back-up that we were going to get. We didn’t want any breaks that would interfere with our gas production. Lowest possible price wasn’t our objective – not for one second. We were making decisions on what was most appropriate – for the long-term. A mixing system that could produce the most gas yet be the lowest on maintenance made perfect sense”. “As well as the pasteurisers”, continued Gary Davies, “the investment in our CHP sees minimal flaring of gas. It all goes to the CHP – and we can now use the excess heat to heat the sludge. The whole focus of our operation has changed, because we look at gas production every day and see how, if possible, we can tweak it to make it better. We might see if we can thicken more, thicken less, change feed rates – look at what is coming in, look at what is being washed away. We’ll never stop wanting to learn and improve”. He added: “Doosan Enpure are very good process people to work with, helping us achieve up to 500kW of electricity (and the same again in heat) – about £800 to £1,100 per day. The pasteurisers make a big positive difference in presenting the digesters with much better material. Further on in the process, we now have far less grit/silt and rag to deal with. Before we had to take a digester out of service, bring in costly tankers to remove two to three metres of grit/silt and rag – but now we’re very much heading in the right direction”. “Initially we blamed the exchangers, as perhaps most operators do,” said Bob. “We tried linking them in series, in parallel, but eventually we found the remedy by introducing an air-line. Our heat exchangers now have no trouble reaching their required temperatures and require very little in the way of cleaning. The downside to this was additional wear to the pasteuriser mixing pumps, caused by aerated sludge. This issue was addressed by upgrading to hardened impellers to improve service life. Davies continued: “Overall, we now have a far more complex plant – yet our investment in quality equipment is saving us money. Not everybody understands the drivers when being on an island. No point supposedly saving £1M on CAPEX if it’s then going to cost you an extra £3M in maintenance. This plant’s performance proves that we are winning the argument”.